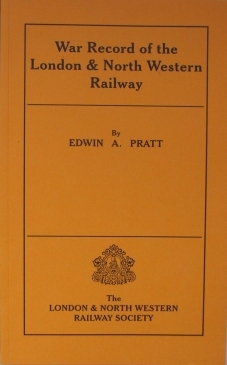 EDWIN PRATT'S account was taken from his two-volume history, published in 1921, entitled British Railways and the Great War. The LNWR extract was published in 1922 and included reviews of the main work. Some of them are reproduced here, to give a flavour of how it was received. "... The good work of the railways was, we fear, taken for granted by most people, but Mr. Pratt has no difficulty in showing that we should have fared badly if the railwaymen of all grades, from the managers downwards, had not been remarkably efficient, industrious and patient ..." The Spectator. "The extent to which every branch of our effort in war was dependent upon railway efficiency may have been guessed at, but has probably never been realised in anything like fullness outside the circle of military and transport control ..." The Observer. "Everything worked so smoothly at the outbreak of war as regards the railways that the plain man might conclude that the task they had to undertake was nothing extraordinary. He would hardly believe that it was only as the result of forethought and planning that it had been rendered possible, because unpreparedness is by way of being our national tradition in war. But here was the exception. The railways were prepared". The Scotsman.